My husband (aka, "tt") loves the Samoa girl scout cookie and will purchase several boxes from the girls during the selling season. I was looking around for an interesting cookie to make and came across this one. 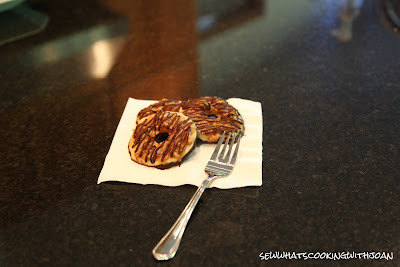 I changed several things from the original recipe (www.bakingbites.com) to give it my own spin and I have to say, that they came out marvelously! My only complaint was that I didn't make enough as they were spoken for rather quickly! 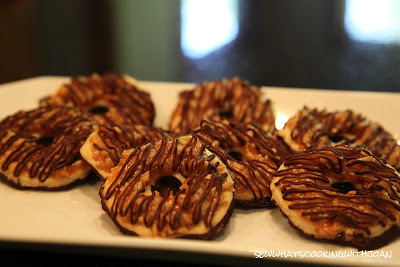 Next time, I will make a double batch of these. I probably will be making them sooner than later!! I don't want you to be disappointed -if you are of the "slice and bake" cookie mind, making these cookies might not be for you. These cookies do take time and effort and a bit of skill. Some may call them tedious to make...I call them WORTH IT!! I broke the project up into two days so that you don't feel like you are spending too much time in the kitchen. It was totally manageable this way and one I would recommend. In a 1-quart saucepan, whisk together sugar, corn syrup, salt and 6 tbsp water and bring to a boil. Cook without stirring until candy thermometer inserted into syrup reaches 340F. Remove from heat and whisk in butter, heavy cream and creme fraiche (the mixture will bubble up) until smooth. 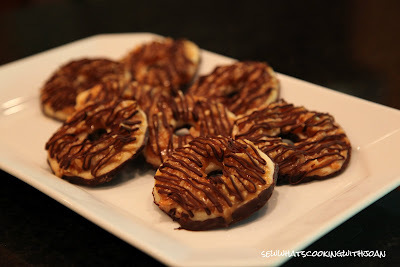 **You can make the topping a day in advance and refrigerate until ready to use. It's actually easier to use when it's cold. 2. Cream together butter and sugar in a large bowl. Mix in flour, baking powder and salt at a low speed. Next, add the vanilla and milk, adding in the milk only as needed to make the dough come together without being sticky (you made not need any at all). The dough should come together into a soft pliable ball. Add in a bit of extra flour if your dough seems sticky. 3. It's easiest to roll the dough out into 2 or 3 batches. I found it was easy to roll each dough ball out onto a silicon mat. Roll out to a 1/4-inch thickness and use a 1 1/2-inch cookie cutter to make rounds in the dough. 4. 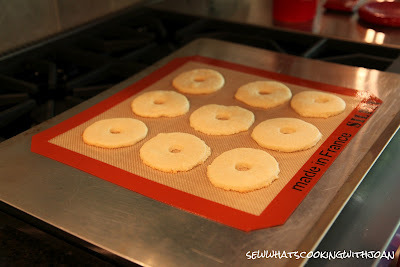 Place on a silicon mat lined baking sheet and make a hole in the center of each cookie. I used the large end of a medium round piping tip. If you don't have piping tips, you can use a knife to cut a small round hole in the center. 5. 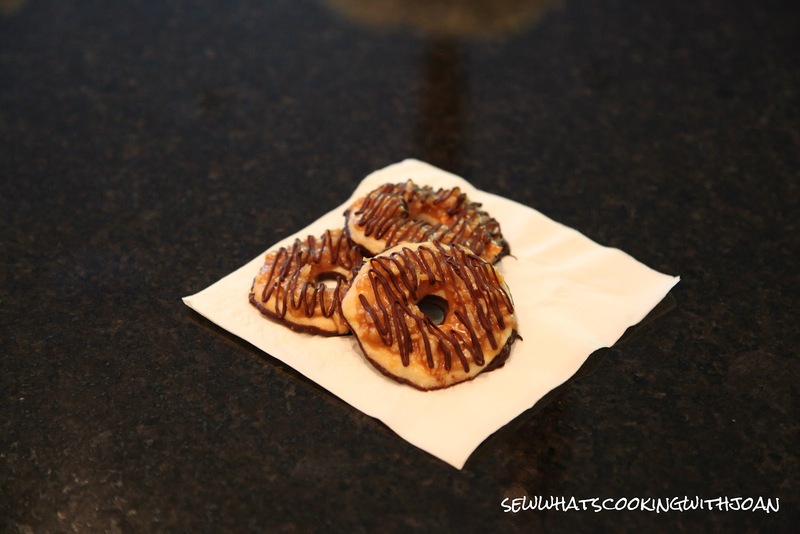 Bake cookies for 10-12 minutes, until bottoms are very lightly golden brown around the edges. 6. Let cool for a few minutes on the baking sheet, to allow them to firm up slightly, then transfer to a wire rack to cool completely. 2. Spread coconut evenly on a rimmed baking sheet and toast 20 minutes, stirring every 5 minutes until coconut is golden. Watch carefully, especially near the end of toasting as it toasts very quickly once it begins to become golden. 3. Cool on baking sheet; set aside. 5. 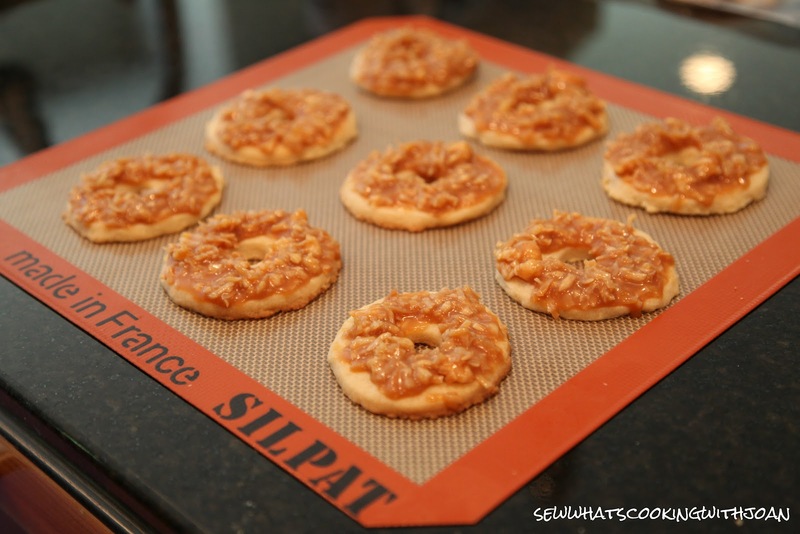 Fold toasted coconut into the salted caramel using a spatula. 6. Using a spatula or offset spatula, spread topping on cooled cookies, using about 2-3 teaspoons per cookie. If you need to, you can reheat the caramel mixture for a few seconds in the microwave if it begins to firm up. I found that the mixture was easier to spread firm, right out of the fridge. Just be sure you use care in handling the shortbread and spreading the mixture being careful not to press to hard and break the cookie. 7. While topping sets up, melt chocolate in a small bowl. Heat on high in the microwave in 45 second intervals, stirring thoroughly to prevent scorching. 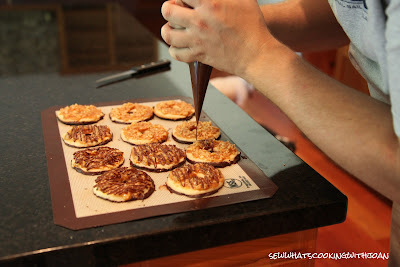 Dip the base of each cookie into the chocolate and place on a clean piece of parchment paper (I used a silicon mat). Once all cookies are dipped, transfer remaining remaining chocolate into a piping bag or a zip-lock bag with the corner snipped off and drizzle finished cookies with chocolate. Store in an airtight container in the fridge. Cookies will keep for a couple weeks if stored properly. We found that they were best right out of the fridge! These were fun to make and well worth all the time. I shared these with neighbors and family and it was unanimous....one of the best cookies they've ever had! 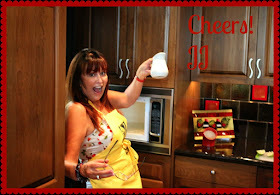 PS As Summer slips away, we here at "Sew Whats Cooking With Joan" hope you have a wonderful long weekend. Whether it be with one last barbeque, the last dive in the pool or lake, or a fun parade, we hope it is filled with peace and relaxation! Hahaha! I see TT's hands in the piping picture, I told you, he like to get his hands in!! Love my family, they just ROCK!! Okay, now, let me tell you how quick these cookies disappeared.... I got 1/2 a cookie!! Wee Bear and I shared!! But, I can say, it was everything it should be and more!! This cookie goes all the way to sinful, just the right amount of gooey caramel and perfect crunch to the shortbread and a chocolate surprise!